Make Ice Cream, Butter and More at this Working Dairy Farm. 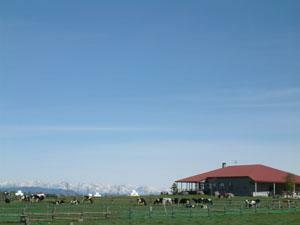 Come up to Nagato Ranch to see the cows and spend a day having fun with dairy-related activities. Nagano Prefecture has a lot of dairy ranches that take advantage of the high elevation (cows like the cooler weather in the summer). Nagato Ranch in the North Shirakaba Plateau is one such ranch. 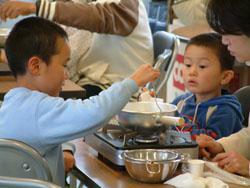 They offer activities making that offers butter, cheese and ice cream using milk from their cows. 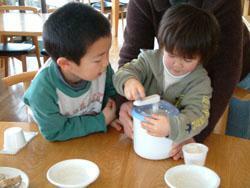 Butter Making: Take milk from the Nagano Ranch cows and shake it to make butter. Enjoy it spread on bread baked on the premises. (Can't be taken home with you.) Sessions are offered at 10:00, 11:30, 13:00 and 14:30 and take approx. 40 min. Cost is 500 yen per person. Number of participants: 2~80. Ice Cream Making: Using milk from the ranch's cows, crank the creamer for 15 minutes and voila! Fresh ice cream like nothing you've ever tasted! Sessions offered 4 times daily (10:00, 11:30, 13:00 and 14:30 and take approx. 40 minutes. Cost is 2000 yen per group of up to 4 people (maximum 12 groups at one time). 9:00-17:30 NOTE: Activities held at above-mentioned times. Rest house Shop is open year-round, but check the website for dates for dairy-making activities. Some are offered only on weekends/holidays. Restaurant open daily Apr. to Oct. (or by appointment Nov. thru Mar.). From Sakudaira Station(JR Hokuriku(Nagano) Shinkansen), take bus (1 hour). From Saku IC, take Route 40 to Route 142 and turn right (Hyakusawa-Higashi signal), then left on to Route 40 (Shirakaba Kogen signal), 50 minutes. From Suwa IC, via Route 152, approx. 50 min. Ikenotaira Hotel & Resort at Shirakaba Lake : Full-scale Family Resort Offering a Hassle-Free Stay. Tateshina Tokyu Hotel : Classic, Luxury Hotel Perfect for Enjoying the Tateshina Wilderness. Auberge Tsutsuji to Kaede in Tateshina : Auberge Restaurant-Inn featuring an open-air onsen bath. Hotel Saginoyu at Lake Suwa : Classic Luxury at Suwa's Original Lakeside Hotel, with Distinct Amber-Colored Onsen Water. Resort Hotel Tateshina : Resort Hotel on the Shores of Tateshina Lake Surrounded by Forests at the Foot of Mt.Yatsugatake. Restaurant CLASUWA : Suwa Lakeside Stylish Restaurant. Sen no Mizu : Heart-warming Nostalgic Home-style Cooking. Teisyaba Garden : Tea Time in a Community Flower Garden. Wintertime Family Fun at a Snow Park : Exclusive Snow Park 1 Minute Walk from this Shirakaba Lake Hotel. Outdoor Family Fun at a Lakeside Amusement Park : Amusement Park and Adventure in the Great Outdoors Beside Shirakaba Lake. Outdoor sculptures : See Spectacular Artwork in a Spectacular Mountaintop Setting. Sake Tasting at the Venerable Masumi Brewery : Sample Sake at Nagano’s Premier Brewery, Birthplace of Yeast Number Seven.